Master electrician Nathan Poland talks about the value of an apprenticeship in the trades. Photo by Judi Currie. As solar energy drives demand for licensed electricians&comma; which is already outstripping supply&comma; one company is investing in growing its own talent pool. 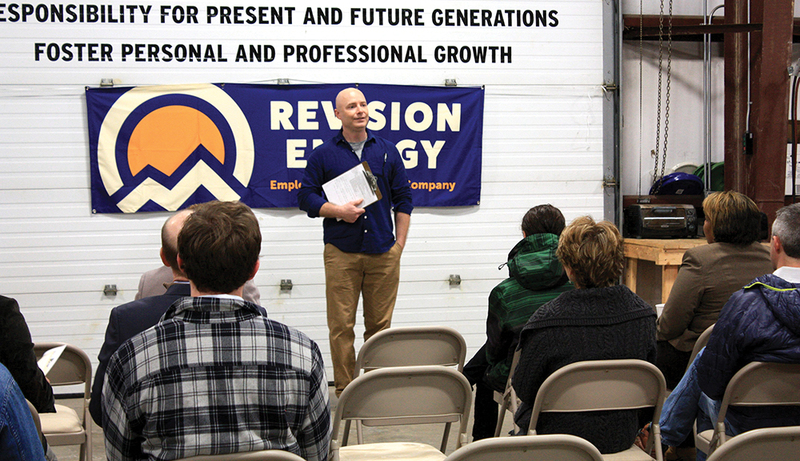 ReVision Energy launched a state-certified electrical training program in November at its NH headquarters in Brentwood with a “learn while you earn” model as part of National Apprenticeship Week. apprentice and becoming an employee-owner of ReVision Energy&comma; which has an employee stock ownership plan. Dan Weeks&comma; ReVision Energy’s director of market development&comma; says ReVision is the first solar company in the country to launch a dedicated and state-certified electrical training program. The school will be led by ReVision Energy master electrician Nathan Poland&comma; a former electrical technology instructor and former director of the NH state electrical apprenticeship program. “These programs will allow workers without a four-year degree to develop valuable skills and to advance in their fields&comma;” Poland says. “Apprenticeship in the trades is a solid career choice. … After four years they can sit for the journeyman certification test ... And the starting salary is very competitive. Currently there are 17 states&comma; including Massachusetts and Maine&comma; that have reciprocal agreements&comma; meaning a NH electrician’s license is valid in those states. Weeks says NH is home to 70 solar businesses&comma; which employ more than 1&comma;000 workers.